Hunters and shooters have been feeding their favorite guns Hornady BLACK® Ammunition for years. Why? Because they know they'll be getting high-quality cases, primers and optimized performance for when it matters most. 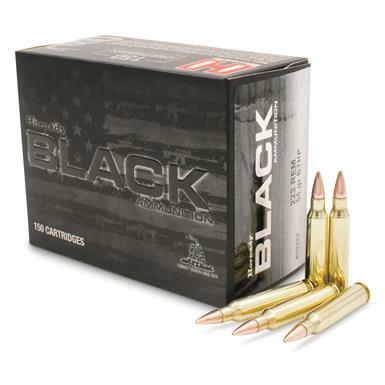 Hornady Black .223 Remington, BTHP, 55 Grain, 150 Rounds is rated 5.0 out of 5 by 3. Rated 5 out of 5 by Forthefall from My favorite .223 round I love this particular ammo and so does my mini 14 and my savage axis. I get sub MOA's with this ammo in the 55 and 75 grain. I am a big fur guy and this round gets the job done well and without making me do a lot of sewing. Rated 5 out of 5 by TRMORR from Great rounds. These are great rounds. Accurate and affordable. They cycle flawlessly in my 1968 mini 14. Of course it's had "a few" modifications but not to the action. Will be purchasing more in the future.